Several years ago, I purchased a really nice barn-style shed to store my lawn mower and a few tools. Since then, I have added a lean-to to the side of the shed – and now park my mower there. As of right now, the inside of the shed is literally over-flowing with tools, Christmas decorations, and an assortment of other stuff/junk. Before you think bad of me, allow me a few more details. I was recently gifted with a huge selection of power tools, fasteners, hardware supplies, and other belongs-in-the-shed type items – but I haven’t had the time to organized them. They’re just in the shed, ready to be sorted. That’s this week’s after-work project. 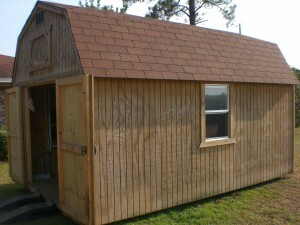 Here’s a picture of the shed from when I first purchased it. It has 2, 4×8 feet lofts, one at the front and one at the back. Not only do I have the shed, which I believe measures 12×16, I also have a playhouse that I built for our kids, which measures 8×12, with 8 foot walls. Between those two buildings, I have attached a roof, which forms a covered-space, for bicycles and garden tools. I’ll show you pictures of this stuff tomorrow, once I’ve managed to tidy things up a bit. Right now, it’s a disaster. I am working out the details (mainly in my head) for adding shelves to the inside of the shed and to the inside of the playhouse. My goal is to have an area for long-term storage AND an area with easy access to the tools (and other things) I use on a regular basis. I am torn between building the shelves – which may be more cost efficient – and biting the bullet and buying some shelving units from the big box store. I have the tools to build the shelves myself, but I don’t really have the time to both build the shelving units AND sort through all of the stuff. I’ll let you know what I decide. I know that I will be giving away a pretty decent amount of the items I was recently given. One can only use so many hammers, I suppose. Oddly, I don’t actually mind the sorting-and-organizing. I actually find it to be somewhat relaxing. What stresses me out (as much as something this not-really-a-big-deal) can stress me out is, my lack of a real system for organizing all of the stuff. Right now, it’s just in there – taking up space – in a big jumble. I have a dozen flashlights, and I’m not sure I could find ONE, if pressed. Today, I started the process, by simply going out to the shed and taking a quick inventory. I also did some quick research, pricing out the cost to build some new shelves and the cost of buying new ones. I also began sorting through a few of the easiest-to-reach boxes. Tomorrow, I’ll make my decision on the shelves, get as many of those installed as is possible, and (hopefully) begin the process of organizing all this stuff. It’s going to take a few days, at a minimum, because this is one of those do-it-right-so-you-don’t-have-to-do-it-again type projects. Thank you for checking out today’s post. I hope you have a blessed day!